Emotional intelligence, "the ability to perceive, appraise and express emotions accurately; the ability to access and generate feelings to facilitate cognitive activities; the ability to understand emotion-relevant concepts and use emotion-relevant language; and the ability to manage one's own emotions and the emotions of others to promote growth, well-being, and functional social relations" (Mayer & Salovey, 1997), was first introduced into the field of psychology by Daniel Goleman's widely popular and influential book Emotional Intelligence in 1995. Since then, there has been an ongoing debate on the concept at different levels of analysis. The first level of analysis is the intellect versus emotions debate, that whether intellect is superior to emotion or emotions are what make life worth living. The second level of debate is on whether and how emotions can be measured, and how it differs from the measurement of intellect.. Finally, the last level of debate is about the foundations underlying emotion and thought. 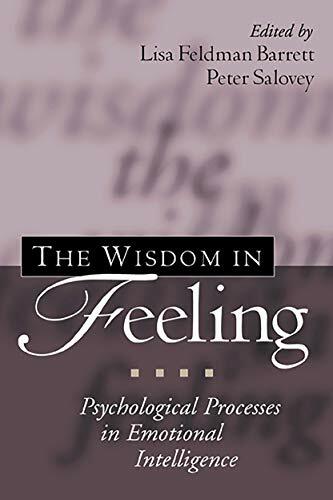 This book is a collection of articles designed under four basic themes in order to explore what exactly emotional intelligence is and in particular, the underlying psychological components that when brought together emerge as emotional intelligence. These basic themes which also form the main chapters of the book are perceiving and appraising emotions; using emotion to facilitate thought; understanding and communicating emotion concepts; and managing emotions in oneself and others. Articles included in these chapters aim to link ongoing basic research on affect and emotion to the ideas embodied in the emotional intelligence concept. In doing so, they provide evidence for the value of emotional intelligence as framework for organizing and advancing theory and research on emotion. Last chapter titled extensions aims to stretch the boundaries of emotional intelligence idea in new and useful ways. Part I of this book deals with the processes involved in perceiving and identifying emotions in oneself and others. Bachorowski and Owren describe the functional acoustics in an emotional signaling system. They argue that there are direct and indirect ways in which perceivers attribute emotion to targets on the basis of their nonlinguistic vocal properties. Especially interesting are the ways in which declarative knowledge about the vocalizer interact with prosodic features of the vocal cues to produce an emotional impression in the listener. Perhaps even more apparent are the emotional cues provided on the canvas of the page. Elfenbain, Marsh and Ambady describe the crucial role of reading facial expressions in emotional intelligence. Their chapter addresses how the meanings of facial expressions are interpreted against a contextual backdrop. Experimental evidence suggests that using or judging emotions "intelligently" involves the regulation of the ability to recognize facial expressions, but nevertheless it is valuable only within its context and adaptive environment. The most important issue is how people use emotional information, not merely that they can perceive it. In the last article of the first chapter, Nelson and Bouton argue that the types of judgments described in the first two articles may have their basis in associative learning. They detail the associative processes that modify or change the affective value of a stimulus. These properties of acquisition and change in the affective significance of stimuli have profound implications for other aspects of an emotional response. Together, these three articles begin to characterize how we come to view certain kinds of cues as emotionally meaningful, and certain types of information as emotionally relevant. Part II describes how affective experiences come to influence thought and action. Gohm and Clore focus on the idea that feelings are functional because they provide information in social judgment. A failure to attend to emotional cues may rob one of important information for judgment, decision and action. Gilbert, Driver-Linn and Wilson also describe the informational value of emotions, specifically the value of anticipated affective states. They argue that the processes involved in "impact bias", the tendency to misjudge both the duration and the intensity of predicted affective reactions, may play out in retrospective accounts of emotional reactions as well, leading to the idea that prospective and retrospective judgments have more in common with each other than they do with actually experienced affective states. Schwarz's article also supports the hypothesis that feelings serve informative functions. It deals with the impact of emotions on the choice of different processing strategies. The expansive orientation facilitated by pleasant emotions encourages top-down information processing that is creative and heuristic driven. In contrast, the detail-oriented focus facilitated by unpleasant emotions encourages bottom-up information processing that is stimulus driven, deductive and engenders the careful scrutiny of incoming information. Schwarz's ideas about how moods tune the cognitive system have implications for a range of outcomes, including stereotyping, attitude change and analytical reasoning. Niedenthal, Dalle and Rohmann also discusses how feeling tunes cognitive processing. The emotional aspects of stimuli form a core organizing principle around which they can be grouped into concepts. They argue that discrete emotional experiences function as the glue in perceiving these concepts, and therefore people literally perceive the world differently depending on how they are feeling. Chapter eight deals with the question that whether emotional intelligence influences psychological phenomena related to persuasion. The chapter begins by barking back to the debate concerning the role of general intelligence in attitude change. In so doing, by investigating the studies on positive and negative relations of intelligence to individual differences in persuasibility. DeSteno and Braverman argue that individual differences in emotional intelligence also function in a similar fashion much like general intelligence, represents a combination of specific abilities and skills. The last chapter in Part II chapter provides a neuroanatomical basis for the idea that feelings influence strategic information processing and planned behavior. According to Savage one of the central purposes of emotion is to assist cognitive processing and strategic behavior. Using examples from psychopathology, especially obsessive-compulsive disorder, savage details how orbital frontal cortex allows individuals harness affective information during the early stages to responding to stimuli, especially those that are novel or ambiguous in some way. Part III deals with understanding emotion, such that individual's knowledge base about emotion and their ability to represent symbolically elements of the emotional response. Denham and Kochanoff give a useful summary of the development of emotional knowledge base that may be involved in other aspects of emotional intelligence. In the following article, Lane and Pollermann describe the different levels of information that characterize individuals' understanding of emotional experience. Using a Piagetian framework, they suggest that there are different levels of development, from understanding emotional experience in a simplistic ways to a more complex conceptual system that is precise and multifaceted. Part IV focuses on managing emotion which is a central domain of interest in research on emotional intelligence. The first article by Gross and John is about providing a framework for understanding the range of strategies involved in emotion regulation. They are also concerned with the effects of such strategies, in particular the consequences of suppression. Next, Tugade and Fredrickson point out the value of positive emotions. They suggest that positive emotions provide a powerful antidote to negative reactions. The final chapter by Parrott explores the consequences of challenging the deeply held belief that hedonism alone is the primary motive for emotion regulation. Parrott argues that there may be circumstances in which it is useful to cultivate negative emotions, which can sometimes be the guide to thinking clearly and behaving appropriately. The last part of the collection provides three interesting directions for future research in emotion. In the first article, Russell and Blanchard suggest that a person cannot be intelligent unless one knows what to be intelligent about. The final two chapters provide examples of how emotional intelligence can make contact with research traditionally considered to be outside the realm of emotion. While Ferguson and Bargh show how a person's initial affective appraisal of a stimulus influences one's attitudes, Blair explores some potential links between the Theory of Mind, the ability to represent mental states of self and others, and various facets of emotional intelligence. Since the publication of Emotional Intelligence by Goleman, even though there has been considerable work on the topic, there is not much research on the examination of basic processes underlying emotional intelligence. This collection is aimed to fill this gap in emotional intelligence literature. The editors bring a wealth of experience to this book by assembling a top-notch group of contributors. Even though it is particularly useful and informative for the researchers in the field and students, it may also be appealing for people outside of the field of psychology who want to learn how emotions shape and influence our thoughts, actions and behaviors.